This pattern was created for a client who has a set of double doors between her lounge and dining room. The old stone house, with traditional sash windows and Oregon pine floors, was being renovated and the lady wanted grapes between her lounge and her dining room. We had great fun planning the design. First, it had to flow across both doors and the transom above the doors. Second, it required lots of clear glass to allow as much light as possible to come through from the dining room into the lounge. Thank goodness for Glass Eye 2000! It makes it so easy to change a design (as many times as you wish) until your client is happy. Getting the pattern the correct size is also no problem at all. All you have to do is measure your openings, give Glass Eye 2000 those measurements and voila! You have a square, rectangle or circle to exactly the dimensions you need. All you have to do now is decorate it with the design of your choice. I suggested clear baroque for the background as this would give a very decorative finish to the panel, without cutting out any light. The client liked the idea so off I went to purchase my glass. 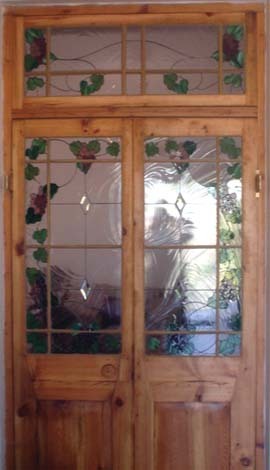 Obtaining stained glass in South Africa is nowhere near as easy as it is in the United States. I had to design using only the Spectrum range, because that brand is most easily obtainable. Fortunately, my supplier had plenty of clear baroque in stock at the time and we spent a nerve-wracking time pulling one sheet after the other to make sure that the swirls in the glass would flow across all the sheets. 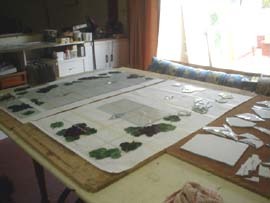 Having secured all the necessary glass, it was now time to start breaking glass and getting the panels together. I did all the grapes and leaves first. Then I laid the sheets of clear baroque on top of the patterns — all of the panels at once in exactly the position they would take up in the door and transom, again, to make sure that the baroque flowed from one panel to the other. Then came the fun part! I cut all the pattern pieces for the background and pasted them onto the baroque in exactly their positions on the panel. That was the easy part. The hard part was scoring and breaking the baroque around the pattern pieces, hoping and praying all the while that the score wouldn't veer off in some crazy direction (as baroque is inclined to do) and ruin the effect I was trying to create. Fortunately, all went well with the scoring and breaking and I could heave a sigh of relief and start putting the panel together. It was well worth the nail biting of getting the baroque just right. The baroque has turned a very simple pattern into something quite beautiful. 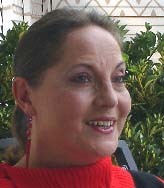 Pat Kenderdine hails from Oudtshoorn, Western Cape, South Africa. 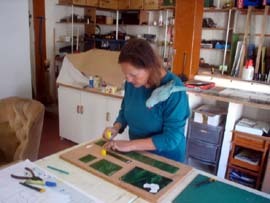 She has been working with stained glass for the past ten years. She recently visited Paned Expressions Studios in Maryland and, during her stay, also visited Bendheim in New Jersey. Standing in the middle of their warehouse, she realized how limited is the range of stained glass available in South Africa. Needless to say, several crates of glass and peripherals were soon on their way from the United States to her studio. Pat has three pattern CDs, produced in collaboration with Paned Expressions Studios: Into Africa, Screen Gems and Stained Glass Lite. You may contact Pat by email.